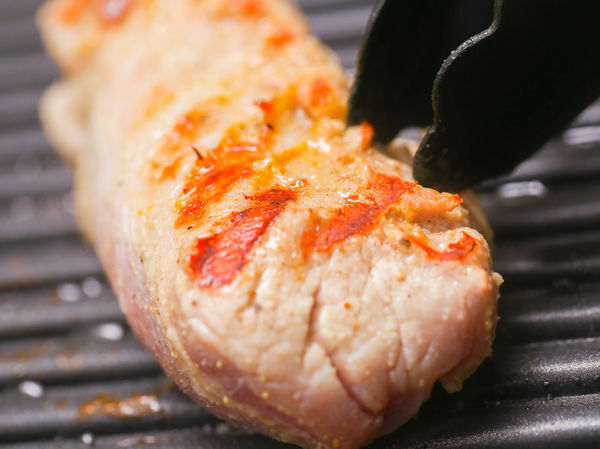 Pork tenderloin is a versatile and lean meat perfect for grilling. 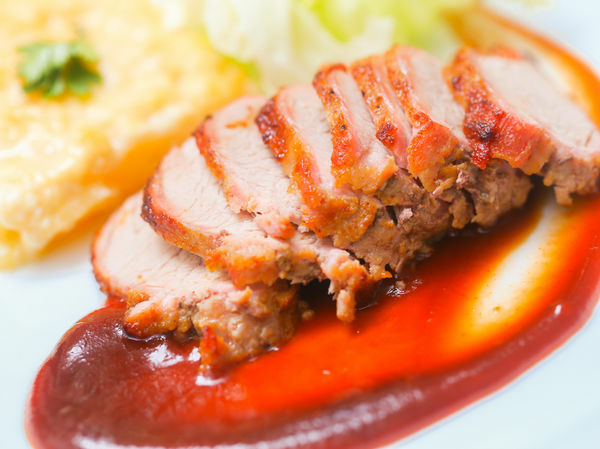 Grilling pork tenderloin correctly helps to keep the meat moist, which is important since pork is easy to dry out and cook tough. You can learn to prep the meat with marinades, and prepare whole pork tenderloin with a variety of dry rubs, or make grilled tenderloin sandwiches, or even throw together a bacon-wrapped and stuffed tenderloin that'll keep your family full and happy. See Step 1 for more information. Tenderloin is a very lean meat, making it easy to dry out and make tough, regardless of how you cook it, especially if you're worried about cooking it well-done because you're concerned about freshness. 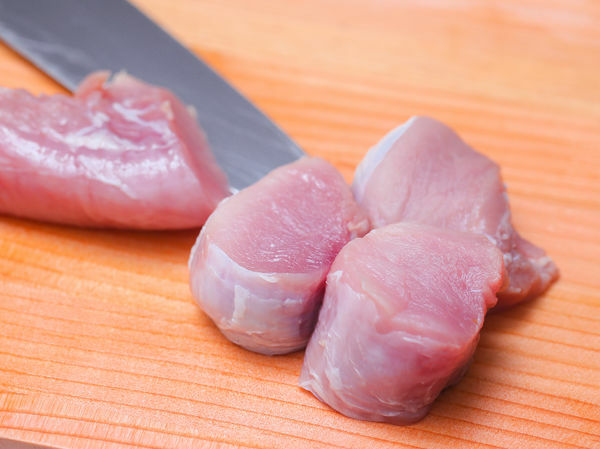 It's perfectly fine to cook pork to medium if you've purchased fresh meat from a reputable source, and it'll be much more delicious to buy it and cook it right away, when the meat is at its peak freshness. Discard pork with any grayness or discoloration, and with any strange odor. Fresh pork should be bright pink and should have no noticeable odor. 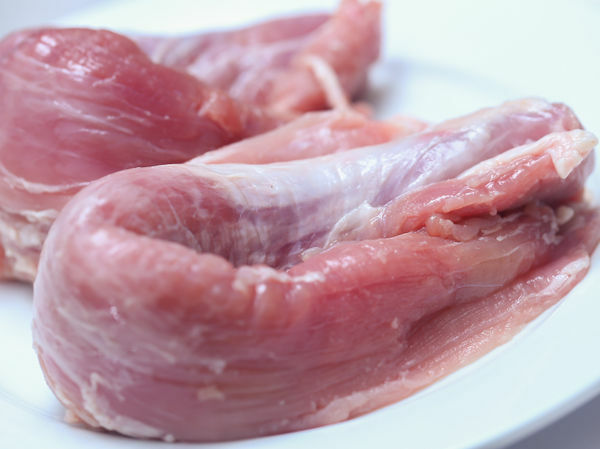 Trichinosis, a parasite once common in undercooked and raw pork products, has been virtually eradicated in commercially-available pork. 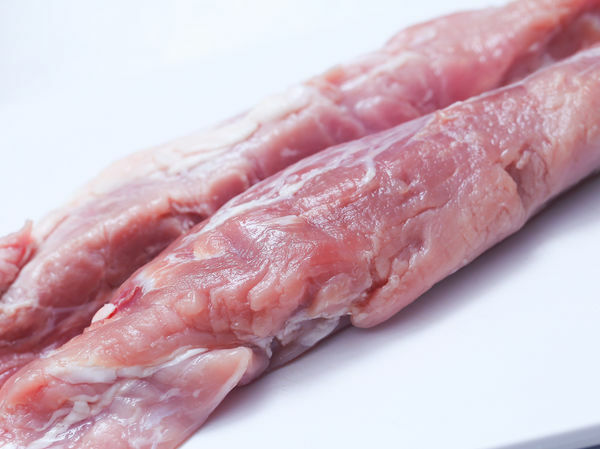 In the US, there are roughly 11 cases of trichinosis reported each year, most of which are contracted from wild game, not pork you bought at the store. While it's not necessary to char the heck out of pork for fear of this stomach bug, pork is as susceptible to spoilage as any meat. 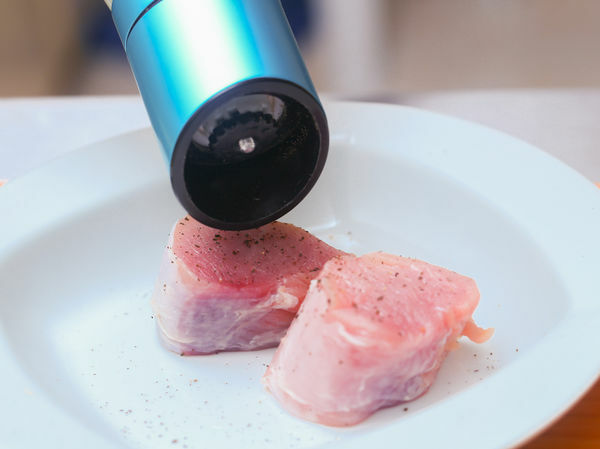 Tenderloin should be mostly pink and clean, with few bits of connective tissue or fat attached. If you get a piece that does have some, trim it off and discard it. 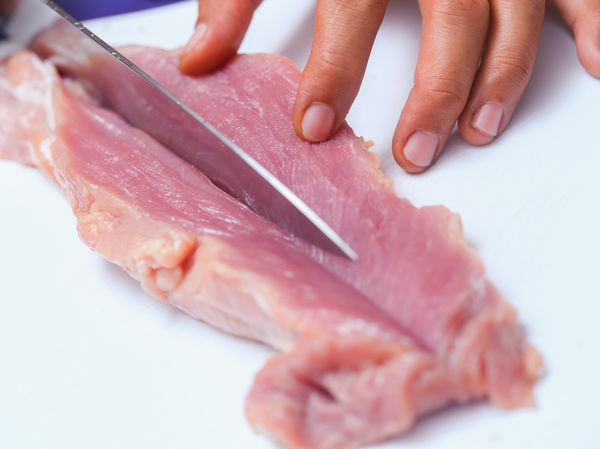 Do not rinse raw meat in the sink, which can spread bacteria around your clean kitchen. Simply pat it dry with a paper towel, if there are any undesirable bits stuck to it. Because tenderloin is such a lean meat, it's particularly amenable to marinades, rubs, and different seasoning combinations. Rub the meat with the marinade of your choice. This might include your own blend of spices or a ready-made marinade from the store. Store the meat in a covered bowl or in a zip-lock bag, then refrigerate overnight, or for at least 4 hours before grilling. 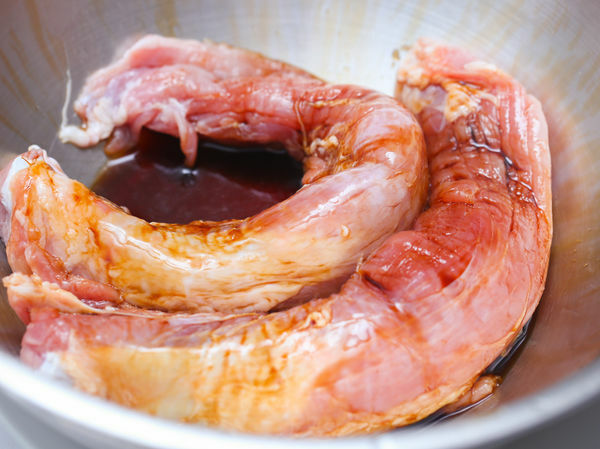 Some good flavor combinations for pork tenderloin include: For classic sweet-sour pork marinade, mix a quarter-cup of olive oil, a clove of minced garlic, and a tablespoon each of brown mustard, soy sauce, brown sugar, with a teaspoon of red pepper flakes if desired. Vary the amounts to taste. Rub into the meat and refrigerate overnight, turning the meat periodically. For a spicy-sweet marinade, mix a cup of orange juice, a tablespoon of tomato paste and Dijon mustard, and a teaspoon each of garlic powder, chilli powder, white sugar, paprika, and Worcestershire sauce. Add a handful of chopped cilantro to the mix. For a sweet barbecue-style marinade, mix 2/3 cup of molasses and a half cup of brown sugar, a half teaspoon each of red pepper flakes, allspice, salt and pepper, then add 2-4 tablespoons of apple cider vinegar. After marinating your pork in the cool refrigerator all night, you need to let it sit out on the counter for an hour or so before putting it on the heat, to bring the temperature down and ensure a more even cooking. If the meat is cold through before you put it on the grill, it'll cook unevenly, and it'll be difficult to cook it all the way through without over-cooking it. When you go outside to light the grill, make sure that your pork is sitting out on the counter. That should give you enough time to make sure the meat will warm up gently, rather than go onto the grill stone-cold. Some tenderloin lovers like to remove the pork from the marinade and add a dry rub just before the meat goes on the grill. Depending on what you've marinaded the meat in, or if you've marinaded it at all, you might opt for a stronger or simpler rub, depending. A dry rub can help to create a caramelized crust that can add a different layer of flavor to the meat. You can use commercial dry rubs, or make up your own. Whatever you use, take a handful of spice and simply rub it into the meat after adding a bit of olive oil to the outside so it sticks. Simple seasoning: Rub the tenderloin with about a tablespoon or two of olive oil, then sprinkle the outside liberally with kosher salt and fresh black pepper. Dried spice seasoning: Rub the tenderloin with a tablespoon or two of olive oil, and a mixture of a teaspoon each of oregano, cumin powder, coriander powder, garlic powder, and thyme. 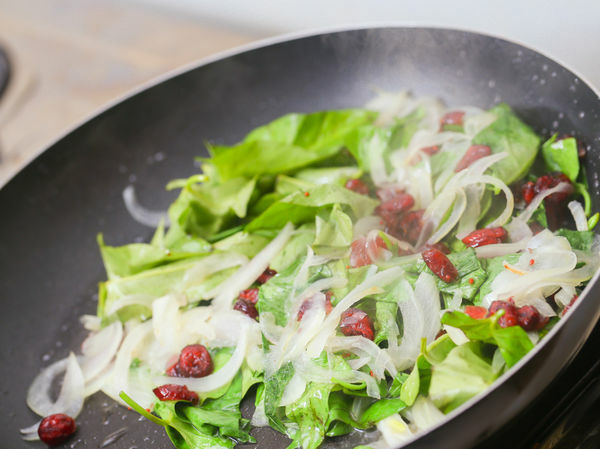 Fresh herb seasoning: Rub the tenderloin with a tablespoon or two of olive oil, then toast up a tablespoon each of fennel seeds, mustard seeds, and coriander seeds in a dry skillet. When they get fragrant, remove them from the pan and crush them in a mortar and pestle, or crush them with the flat side of a kitchen knife. Mix with a teaspoon of red pepper flakes, two tablespoons of fresh chopped rosemary, and salt and pepper to taste. Massage into the pork. When your meat's ready to go, you should start the grill about an hour before you plan on eating. 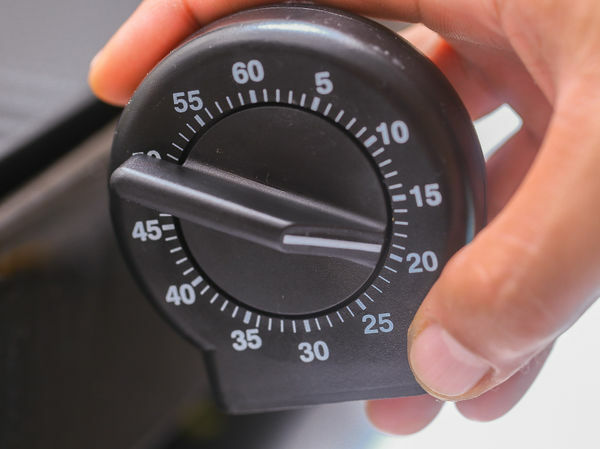 You want to give the grill about 20 or 30 minutes to heat up to the proper temperature (it'll be quicker with a gas grill) and about 20 minutes total cooking time, with ten minutes for resting. Start it about an hour before you want to eat so you won't' have to rush around. 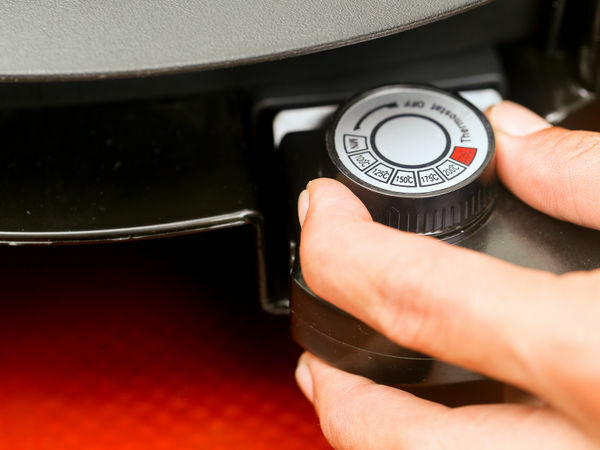 On the gas grill, you can probably get away with starting the grill a few minutes before you put the meat on. You want to have a cooler spot on the grill, though, so heat a section to one side so you can move the meat elsewhere and let it cook slowly over indirect heat. On the charcoal grill, pile your coals to one side of the grill and let them reduce to a nice charred ashy glow before you put the meat on. This way, you'll be able to sear them over the coals and move them to the other side of the grill to finish them. Place whole tenderloin first on the hottest side of the grill, closing the lid and letting each side sear for about 2 minutes over the direct heat. Leave it alone. After the time has elapsed, turn the meat one quarter-turn, letting the next side sear. Depending on the size of your tenderloin and the shape of the cut, you may do this four times, or fewer. Once the meat has developed a nice brownish char on the outside, you can move it to the cooler part of the grill and let it cook longer at a slightly less severe temperature. On a charcoal grill, move your pork to the side away from the coals, positioning the meat so that it's not in direct heat. 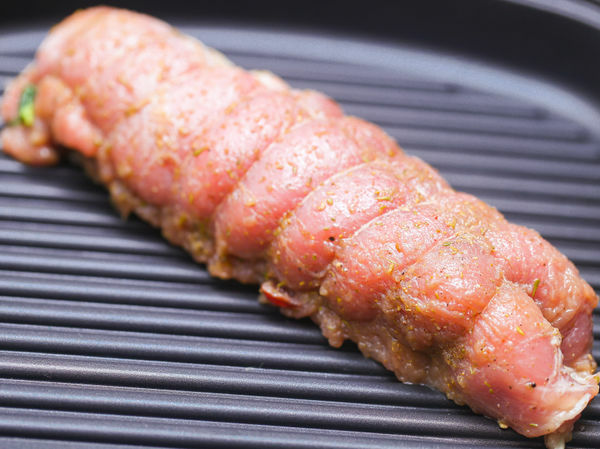 On an electric grill, position the meat next to the heated grate. 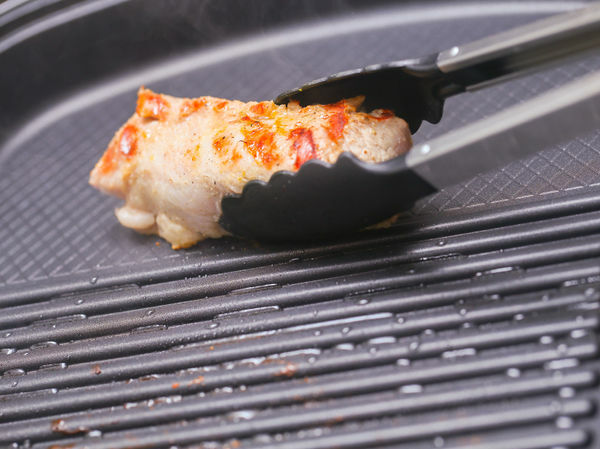 Close the lid to trap the heat in the grill, leaving the top-vent on your grill about half open, if your grill has one. Many grillers get nervous closing the lid, thinking something terrible is going to happen if you can see the meat the whole time. Try to let go of this concern. Grilling over extremely high heat with the grill open is inefficient and uneven, making it easy to dry out the pork and overcook it. Use the grill the way it was meant to be used: close the lid, set a timer, and kick back while the meat cooks. Over the course of the cooking time, you might open the grill once or twice to turn the pork over and make sure it isn't drying out. Keep an eye on the coals to make sure the heat stays up and the temperature in the grill remains relatively constant, but try not to fiddle with it too much. Leave the meat alone and let it cook. After 20 minutes, it should be close to done. If you use a meat thermometer, the internal temperature should be somewhere between 140 to 155 degrees F (68 degrees C). Put your meat on a cutting board, or a platter, and cover with tin foil to let the meat rest before carving it up. It'll be much juicer and more tender if you let it sit for a couple of minutes. Resist the urge to dig in! Meat isn't rested because it's too hot to eat, it's rested to make it more tasty. Meat should be rested to give the exterior a chance to cool slightly, so the juices will reabsorb into the cut, making the meat more flavorful. If you cut into the meat right away, the juices will run all over the plate and you'll lose a lot of flavor. 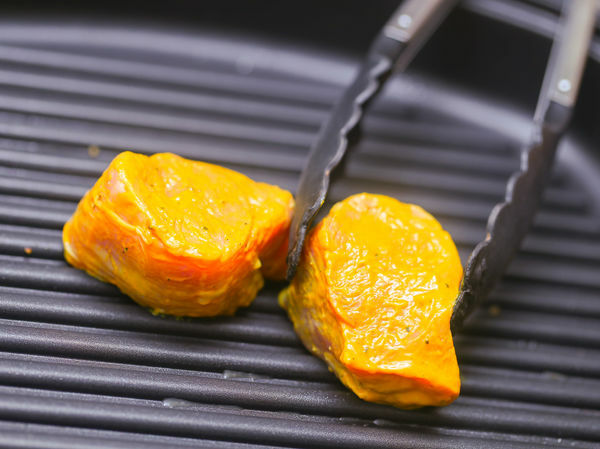 If you'd rather grill up individual portions to account for particular tastes, want to make grilled tenderloin sandwiches, or you just want to experiment with a few different seasonings, you can remove the tenderloin from the marinade and slice into portions before grilling. Slice 3/4 to an inch thick. Consider pounding out the steaks to about a half-an-inch, using a meat tenderizer. Place each steak under a clean towel, then use a tenderizing hammer to bang out the steaks and flatten them. In the Midwest, pork tenderloins are pounded out to almost comically-large sizes, roughly the size of a plate. Put together on a bun, the resulting sandwich should resemble nothing so much as the planet Saturn. It's a state fair classic. Cutting into steaks and pounding out the meat should be done after the meat has been marinaded, just before you're about to grill them. Don't try to marinade pounded-out tenderloin. Before grilling, sprinkle your desired seasoning on both sides of the steaks, or simply dress them with a brushing of olive oil, salt, and pepper for a simple and perfect start to a tenderloin sandwich. Lots of flavor comes from searing the meat and creating nice grill marks on the outside of the steaks, then moving the steaks away from direct heat and covering the grill to let them cook for a few more minutes to finish the inside of the meat. Cook for approximately 4 to 6 minutes on each side. If you want to check the temperature, it should be about 155 degrees F (68 degrees C) when it's time to remove the steaks from the grill. 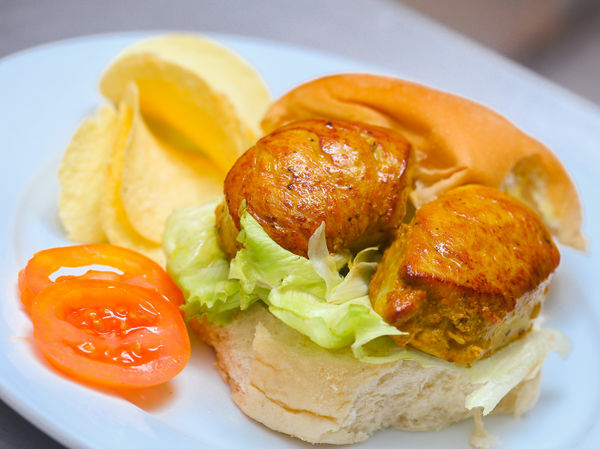 After your tenderloins rest for 10-15 minutes, under tin foil, serve them sandwich-style on buns topped with dill pickle, brown mustard, and raw white onion. That's eating. Take a sharp knife and cut the pork lengthwise, approximately 3/4 of the way through. Open the cut, flattening the meat out as much as possible. If you want, you can take a meat tenderizer and hammer out the pork slightly, to open up the tenderloin to hold all the stuffing. Depending on how much stuffing you make, it might be necessary. You'll end up tying it up anyway, so feel free to flatten it out considerably. 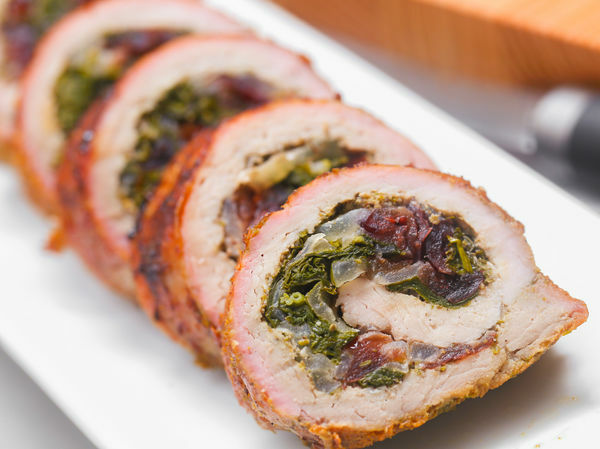 Stuffing tenderloin with a mixture of dry bread, cheese, bacon, and vegetables can up the ante considerably. If you want to kick grilled tenderloin up a couple of notches, stuffing it is the way to go. You can experiment with ingredients that you like, or go with a few tried-and-true standards. Bacon-mushroom stuffing: In a skillet, crisp up 3-4 slices of bacon, then add two cups of white button mushrooms, and a pinch of salt. Let the mushrooms sit untouched for one minute, then stir to coat them in the mixture and cook until soft. Add 2 cloves of minced garlic and cook until soft. To this, add 2-3 tablespoons of dried breadcrumbs, and a handful of fresh chopped parsley to complete the stuffing mixture. Italian Spinach stuffing: In a food processor, add a cup of fresh baby spinach leaves, a half cup of fresh basil, two cloves of garlic, and 2-4 tablespoons of grated parmesan cheese. Add a pinch of crushed red pepper, Italian seasoning, and a drizzle of balsamic vinegar to finish the stuffing. 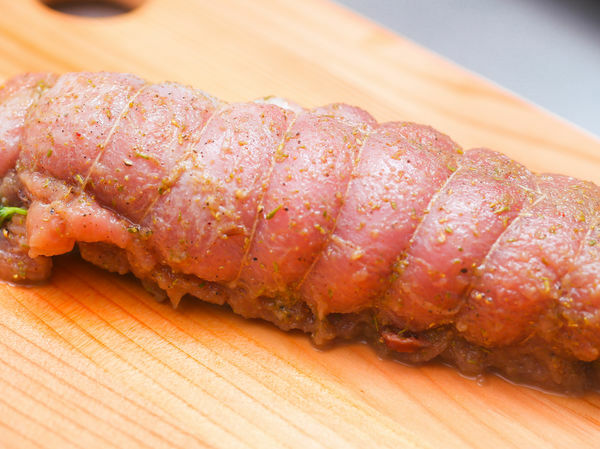 Bacon-Wrapped Stuffed Tenderloin: In a bowl, combine a small finely chopped onion, 1-2 stalks of celery, 1-2 slices of dry toast, torn into small pieces, 3 tablespoons of melted butter, and salt, pepper, and oregano. Use this to stuff the tenderloin, then roll it up and wrap the whole thing with 6-8 strips of bacon, around the width of the meat. Tie it and grill it as normal. It's a delicious combo. After you've flattened it out slightly, you can spread an even layer of whatever stuffing you've mixed up over the inside of the meat, then either roll it up or truss it up, depending on how flat it is and how thick a layer of stuffing you've added. If you want to roll up your tenderloin, spread a thin layer of stuffing on the meat, no more than a quarter inch or so. Start rolling the meat on the long flat side, tucking the stuffing on the inside, so it spirals. After you've rolled it up, tie it to keep it together. If you want to keep the tenderloin more whole, don't pound it out, and stuff your stuffing into the butterfly cut as thickly as you want. Wrap it tightly in plastic wrap to get the shape to hold, then you can tie it up with twine before grilling. 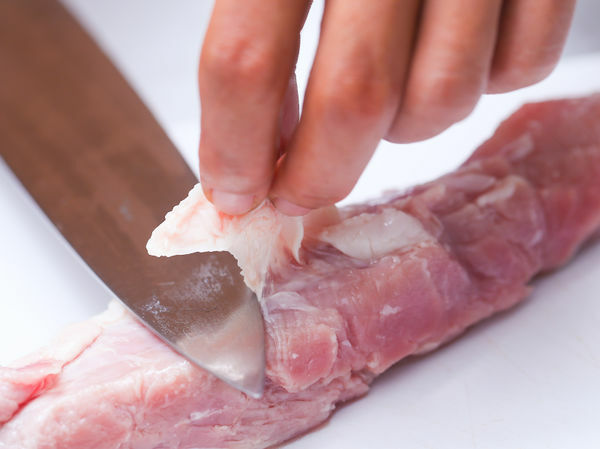 Wrap a piece of cooking twine around the width of the meat to close up the cut. You don't have to get fancy, just take a few short pieces of twine and tie at least three times around the meat, one in the middle, and one at each end. If you don't have cooking twine, you can use some kebab skewers to pin the 2 sides of the meat together, pinching it closed. After the meat is cooked, remove the skewers and slice normally. Follow the basic instructions for grilling a whole tenderloin, browning on all sides, then cooking at a cooler part of the grill for about 20 minutes. 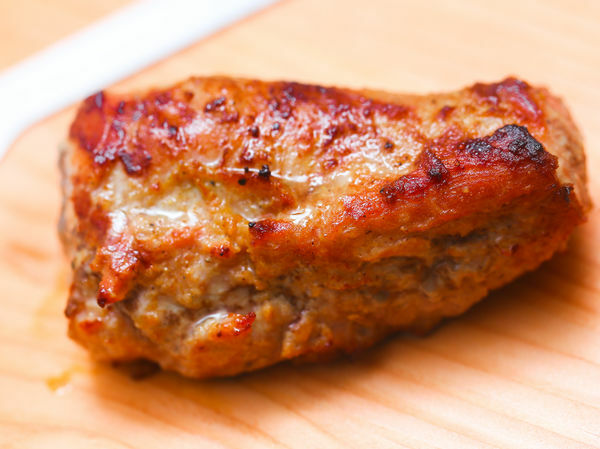 If you've got a particularly-messy stuffing, you might move the tenderloin onto a piece of tinfoil after moving it to the cooler part of the grill, to collect the mess. Take some care when you're testing the temperature of the meat, so you don't stick the reader into the stuffing, getting an inaccurate reading. The internal temperature of the meat, not the stuffing, should be between 140 and 155 degrees F (68 degrees C) according to a meat thermometer. Don't remove the twine right away, or the meat might start to unroll and come apart. Let the stuffed tenderloin rest normally and it'll hold it's shape. 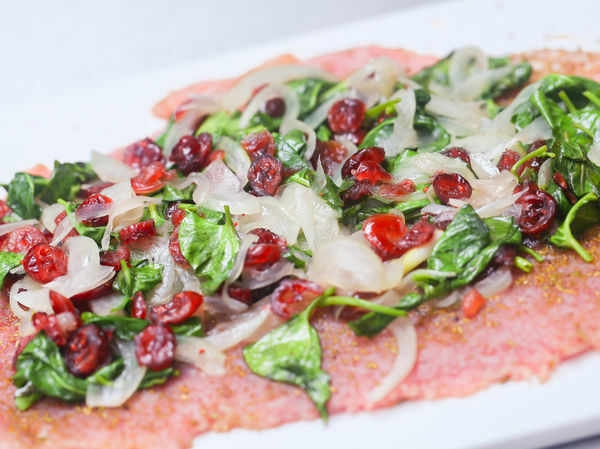 After 10 or 15 minutes, remove the twine and slice into inch-thick portions, and serve.